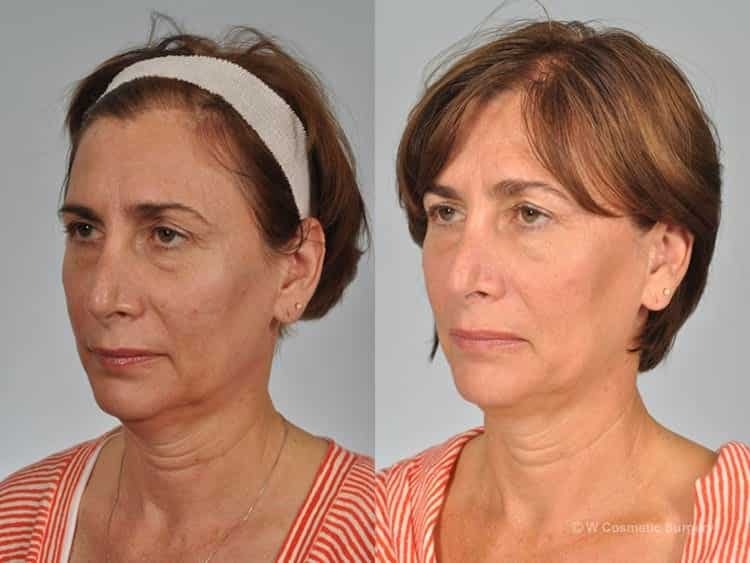 Our real patient before and after Botox® photos feature dramatic results. Whether you’re looking to reduce forehead lines, smooth skin around the mouth, or ditch the crow’s feet, Botox® is a great way to get wrinkle free skin. Contact us to learn more about how Botox® can help you regain your confidence! 42 year-old pre and post Botox® to glabella (11's between eyes) and crow's feet and filler to lips. A 54-year-old woman who had Botox® administered to forehead, glabella, crow’s feet, chin, jowls and neck. Note: overall improvement in all these areas, including the wrinkles in the neck and chin. 50 year old woman who had nanodroplet Botox® injections to the forehead to change and elevate the brows to make them appear more elegant, and the jowl region to improve the marionette area. 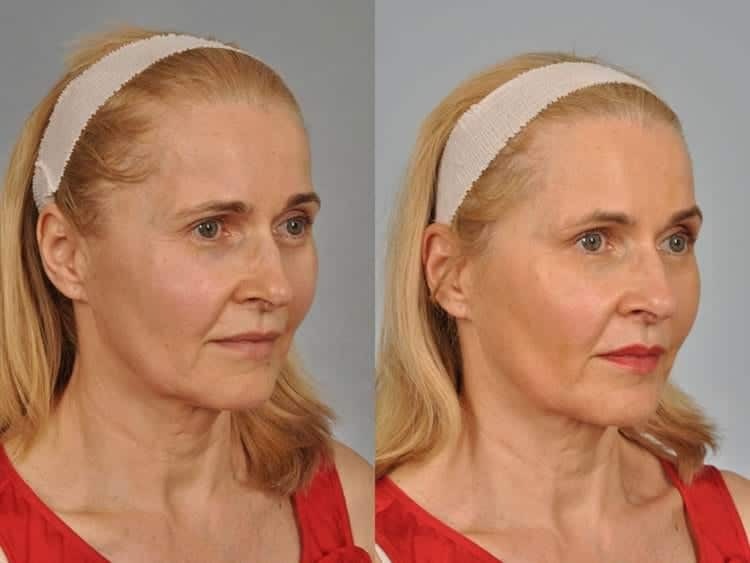 56 year-old woman who had a Dysport® "facelift", or injections to elevate the brows, to lessen the depth of the jowls, and to improve the cords in the neck. A 56 year-old woman who had Botox injected under the lower eyelid lashes to decrease the amount of fullness in lower lids. 56 year-old woman who had Botox injections to the brow area. Pre-existing asymmetry of the brows stays the same with both brows slightly elevated after the procedure. Restylane® was used to treat under the eyes and to line the lip and for the nasolabial fold. The marionette lines and chin were treated with Juvederm®. Chin is improved, lips are fuller, and marionette lines are less deep. 42 year-old after nanodroplet Botox® injection to elevate the brows. One syringe of Restylane® was also administered to the cheeks, under-eye region (tear trough) and the lips. Lips look natural and the brows are elevated. A 54 year old woman had two syringes of Restylane® under her eyes, in the brows, chin, nasolabial folds and cheeks. She also had her lips lined with Juvederm®. 54 year-old woman with drooping brows, droopy eyes, volume loss after weight loss. She has been treated with nanodroplet Botox® to elevate the brows and lids. 64 year-old woman shown before and after Botox® brow elevation using microdroplet technique. Botox® was also used to diminish marionette lines, chin dimples, and to improve neck sagging. 44 year old woman had nanodroplet Botox® to elevate the brows, lessen the wrinkles between the eyebrows and to diminish crow’s feet. Improvement in the eye region and improvement in the depth of the eyelid crease. 45 year-old woman had Botox® to the crow's feet and glabella to lessen the appearance of fine wrinkles when smiling. Botox was also used to thin the jawline and to elevate the outer corners of the brows. 65 year-old woman had Botox® to improve crows’ feet and wrinkles in the glabella. 72 year-old woman had Dysport® to correct irregularities in the neck. (Dysport® neck lift). 50 year-old woman had Botox® in forehead, crow’s feet, neck, and jawline. Patient also received one syringe of Restylane® to lips and corners of the mouth, and to ear lobes. 56 year-old woman had Dysport® between the eyes to improve the "11’s" (the wrinkles in the glabella).